The Bairns put in comfortably their best half of the campaign as they raced into a two goal lead inside the first 25 minutes, before a second half collapse ensured a 3-2 defeat. 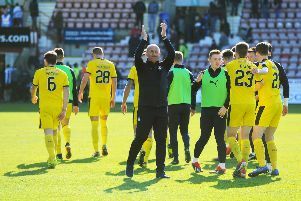 The travelling Falkirk supporters must have been rubbing their eyes in disbelief at the first half performance, which was completely unrecognisable to almost anything seen this season. Andy Irving pulled the strings in the midfield and was key in both goals as 18-year-old debutant Zak Rudden ooked like the striker that has been missing for far this campaign. Petravicius found his right foot as he slammed home the second and Paul Paton put in his best performance of the season, too, in a match that suited him perfectly. The same old problems were evident almost as soon as the second half got underway, however, with manager Ray McKinnon claiming the players simply didn’t follow second half instructions. It was crucial that Falkirk didn’t give Ayr, who are prolific goal scorers, the chance to get back into the match and kept it tight for the opening stages of the second period. They did, however. Irving, brilliant in the first period, gave the ball away on 48 minutes and allowed Lawrence Shankland to further increase his worth with a strike from 20 yards which snuck through Leo Fasan. The keeper has been Falkirk’s most consistent performer this season but won’t want to see that one again. As soon as that ball hit the net, there was instantly that “Here we go again” feel to the game. Ayr were completely dominant and ruled out all of the Bairns’ hard first half graft in a little under 20 second half minutes. Michael Moffat nodded the ball to Andy Geggan and the ex-Dunfermline man equalised with a lovely half volley from inside the box. Fasan’s day got worse just two minutes later. Tweets and Facebook posts were still being sent out to inform the fans that it was 2-2, and it wasn’t, it was 3-2. A relatively poor ball into the box went through Fasan and Kidd clattered the ball into the back of the Italian and into the net. Somerset Park’s stadium announcer gave it to Shankland, but video shows he was beaten to the ball by Kidd. Falkirk scrapped to the end before Paul Paton trudged over to apologise to supporters that had travelled. There’s miles to go, but that first half will give fans some encouragement as they prepare for next weekend’s home match against Dundee United. McKinnon will hope to get one over his former employers and United manager Csaba Laszlo, who has been under pressure, seemingly, for months.